No. 10, Jalan Anggerik Mokara 31/49, Kota Kemuning, Seksyen 31, 40460 Shah Alam, Selangor, Malaysia. We have been active in the field of Palm Oil Mill, Oleo Chemical Industry, Water Supply & Waste Water, Pulp & Paper Mill, Oil & Gas and other general industries. We have more than 15 years experience in import, export & trading business. 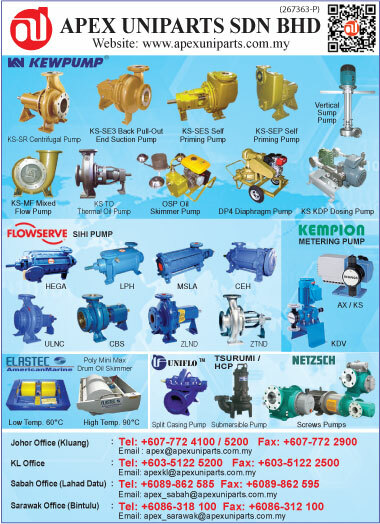 Our main product are mainly pump & motors, valve & actuators, pipe and fitting. In 1991 Apex Uniparts formed a subsidiary company Apex Uniparts (K.L.) Sdn. Bhd. The main activity of the company is primarily to carry out trading in Central & Northern Regions. Over the years, Apex Uniparts has also formed a few associate companies & branches in Sabah & Sarawak. Apex Uniparts has recorded consistent growth in developing its products and management. We are firmly committed to supply high quality products at competitive prices complete with good service. We are ready to provide engineering services such as pumps sizing, selection of equipments, engineering consultancy and maintenance service to fulfill our customers’ needs & requirements. As well as expanding our existing product ranges, our company has also diversified into process control and instrumentation business.